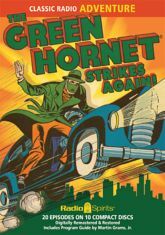 In 1948, America was buzzing with crime, corruption, and vice -- but The Green Hornet was buzzing too! The post war era paved the way for a new kind of criminal, and our hero found himself embroiled in espionage (in addition to his regular racket busting). And in this major chapter in the legend of the masked vigilante, Miss Case stumbles on a secret and takes on a more significant role at the Daily Sentinel. Join Britt Reid and his faithful valet Kato for twenty thrill-packed adventures of this rousing radio classic - many of which have not been heard since their initial broadcast more than fifty years ago.